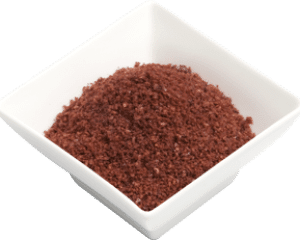 Sumac crushed is obtained from the dried berries from a bush that grows in the Middle East and southern Italy, and it is essential for the Middle-Eastern cuisine specially Persian, Lebanese, and Turkish. In Middle Eastern cooking sumac is used as a souring agent instead of lemon or vinegar. Sumac is delicious on roast meat & in particular lamb, when mixed with paprika, pepper & oregano. It has a tangy, lemony and fruity sour flavour and a fruity aroma that was once used as the tart, acid element by Romans. It can be used as a substitute of lemon in any dish on which you might squeeze fresh lemon juice. Also, its deep red-dark purple colour make it very attractive garnish. Use Sumac generously as a souring agent. It can be used as an alternative to lemons for a similar flavour, although is not as overpowering as lemon. It is good for kebabs, chicken, fish, pita bread, and in salads. Combine with a small amount of olive oil and rubbed into meats- especially good with chicken and fish, or used to make a delicious marinade. It compliments well tomato & avocado. Use to season white meats during cooking. Sumac forms a tasty crust when coated onto lamb joints before cooking. Use to prepare Jordanian spice mixture za’atar, combined with sesame and thyme. Sumac has medicinal properties and health benefits. Some of the common benefits are antifungal, anti microbial, anti oxidant and anti-inflammatory. A sumac drink may help to ease upset stomach, constipation or even reducing fever. Also, it is a rich source of Vitamin C, contains anticancer properties and help to treat cardiovascular diseases, stroke, diabetes and obesity. Try to select high quality of Sumac ground with a reddish purple colour and strong aroma and astringent taste. Store in a cool, dry place in an airtight container. PLEASE NOTE THIS PRODUCT USES SALT IN THE CURING PROCESS. If you are required to eliminate salt from your diet for kidney disease or liver disease then substitute lemon myrtle or lemon juice into the recipe. Other names or spelling: Elm Leaved Sumac, Sicilian Sumac, Sumach, Sumak, Rhus coriaria, Elm-leafed Sumac; gewürzsumach (German); kankrasing (Sumac in Hindi); shumac; Sicilian sumac; somagh (Farsi); sommacco (Italian); soumaki (Greek); sumac (French); sumac, Somak (Turkish); sumaq (Hebrew); summaq (Arabic); zumaque (Spanish).